Boggs George "Ole Boggs" Collins, 88 [sic, sb 93], a lifelong resident of Huttonsville, passed away at 6:20 p.m. Monday, Oct. 18, 2004, at his residence. He had been in failing health, however, death was sudden and unexpected. Born Sept. 21, 1911, in Huttonsville, he was the son of the late Forrest and Maude Boggs Collins. In January 1949, he was united in marriage to the former Mary Emily White, who preceded him in death on Jan. 19, 2004. Boggs is survived by a daughter and son-in-law, Sheila McCauley and husband, Larry, of Huttonsville; one son, Tommy Collins, who made his home with his Dad; and two sisters, Mary Collins Miller and husband, Bob, of Waynesboro, Va., and Adalade Kesterson of Parkerburg, Va.
Also surviving is one granddaughter, Shelby Amber McCauley; several nieces and nephews; and many, many friends. He will be sadly missed and in our hearts forever. Boggs was the primary caretaker and gravedigger for the Brick Church Cemetery at Huttonsville from 1960 until 2001. He was a veteran and served with the U.S. Army's 509th Parachute Infantry Battalion. He participated in airborne combat missions in North Africa and in Italy at Avelino. He also participated in two amphibious operations at Naples and Anzio beachheads. On Aug. 15, 1944, Boggs also participated in the lead combat team for the airborne jump into southern France. He was awarded the Distinguished Service Cross, Purple Heart with two clusters, French Citation, Combat Infantryman Badge, and American and European Theatre Ribbons with five Battle Stars. Boggs was also an honoree of the National World War II Memorial in Washington, D.C.
Boggs was a Methodist by faith. Preceding him in death were an infant daughter, Patsy Jean Collins; one son, Layne Collins; and two brothers, Carol and Lee Collins. Friends will be received at the F.E. Runner Chapel after 6 p.m. today. The Rev. Frank Long, pastor of the Mill Creek Memorial Mission Church, will officiate at a service at the Runner Chapel at 7 p.m. today. At the request of the deceased, the remains will be cremated after the visitation. A memorial service for the interment of the cremains in the Brick Church Cemetery will be at a later date. The F.E. Runner Funeral Home is in charge of the arrangements for Boggs George "Ole Boggs" Collins, (304) 613-2445. 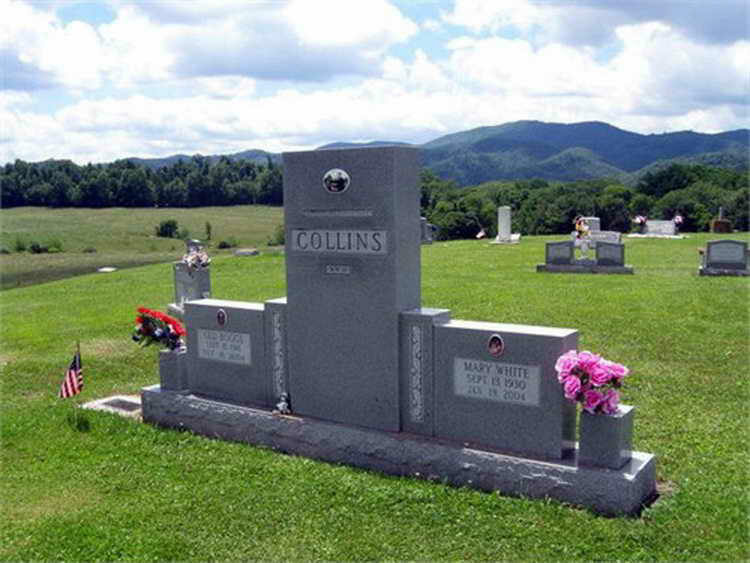 Grave marker for Boggs G. Collins in the Old Brick Church Cemetery, Huttonsville (Randolph county), West Virginia. Boggs enlisted in the Army at Ft Hayes, Columbus, Ohio on 12 February 1942. He was assigned to the 509th PIB (later redesigned as the 2nd Battalion, 509th Parachute Infantry Regiment). Boggs was one of about 50 survivors of the original 700 who entered the battle near St. Vith, Belgium. At the end of January 1945, the 509th was disbanded, and the men left were used as replacements for the U.S. 82d Airborne Division.